This is the first of several newsletters that you will receive as a participant in the Union Town Plan. The Plan is being produced by the Boone County Planning Commission at the request of the City of Union, and is in response to the reconstruction of U.S. 42 by the Kentucky Transportation Cabinet. Obviously, these improvements will bring rapid development to the Union area. The Union Town Plan is a concerted effort to plan ahead of the development and produce a unique place of which we can all be proud. The final product will include a detailed land use plan, zoning map, and design requirements. The process is designed to make sure that the Plan is supported by the land owners, citizens, and developers. During late April and early May, the Planning Commission sponsored three public workshops to determine general opinions of the future of the Union Town area. Overall, the property owners and citizens placed a high value on the pastoral, scenic quality of old U.S. 42. Union should be distinctive and unique, and many vision an expanded downtown Union area with a "quaint Town Center." Businesses would be centrally located with a mixture of land uses. Within the Town Center, formal gathering places and parks were suggested. Several residents mentioned Mariemont and Hyde Park as unique local communities, and New Albany, Ohio, and Hilton Head, South Carolina as examples of good development control. New development should share a common architectural style that should ideally "look like Kentucky." Many residents suggested that signage be tightly controlled, and that they do not want industrial development or another "Dream Street." Most people recognized and commented that the Union Town Plan will only be as good as the implementation and zoning control that occurs over time. Many residents voiced the need for additional park land and open space for bike riding, hiking, and horseback riding. A formal public park was suggested for Union. Green space and trees were seen as important along roadways, and could also help with increased flood and drainage problems. Green spaces and pathways should link the Town Center to commercial areas, residential areas, churches, and schools. The next public meeting will be held on June 8, 1998 at the Ryle High School Auditorium, from 7:00 P.M. to 9:00 P.M. This important meeting will include a presentation of two Union Town land use plan alternatives by Myers Schmalenberger Meisner consultants. This is an excellent opportunity for citizens and property representatives to react to the alternatives and help guide the Plan. Comments and opinions are welcomed and will be recorded. If you have any questions, please don't hesitate to call me or John Huth at the Planning Commission office at 334-2196. This is the second newsletter issued to all participants in the Union Town Plan. The Plan is being produced by the Boone County Planning Commission at the request of the City of Union, and is in response to the reconstruction of U.S. 42 by the Kentucky Transportation Cabinet. Obviously, these improvements will bring rapid development to the Union area. The Union Town Plan is a concerted effort to plan ahead of the development and produce a unique place of which we can all be proud. The final product will include a detailed land use plan, zoning map, and design requirements. The process is designed to make sure that the Plan is supported by the land owners, citizens, and developers. Some of you are new participants in the Study process, because the Study Area has been expanded to include additional properties west of the existing U.S. 42. These properties are primarily in the Clarkson Lane and Hathaway Road areas, and have been added because of the visual impact that potential development along the new U.S. 42 alignment could have on them. On June 8th at Ryle High School, the consultants, Myers, Schmalenberger, Meisner, presented three alternative development ideas in the form of color drawings. They also presented several images of traditional town development, as opposed to the usual suburban commercial and residential development found in areas like Boone County. 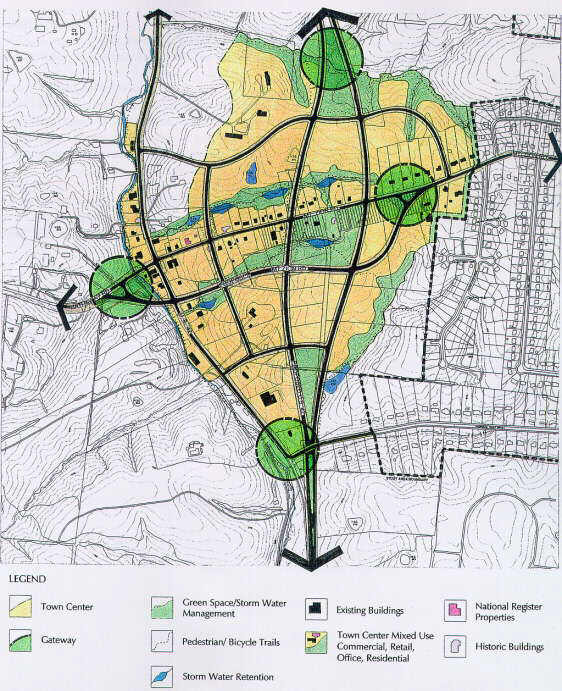 Most attendees supported the concept of a concentrated town center that would contain almost all of the commercial land uses in the Study Area, while large parts of the new road corridor would contain residential and institutional land uses within all three alternatives. There was a wide variety of opinions regarding the issue of residential density. Some meeting attendees favored either areas of cluster density approaching 8 dwelling units per acre, while others favored a low density of up to one dwelling unit per acre. No comments were made in favor of medium density residential development in the 3 to 4 dwelling unit per acre range. Green spaces and pathways were found to be important to link the Town Center to commercial areas, residential areas, churches, and schools, and should contain effective storm water control impoundments. The next public meeting will be held on July 8, 1998 at the Ryle High School Auditorium, from 7:00 P.M. to 9:00 P.M. This important meeting will include a presentation of a Preliminary Union Town Plan by the consultants. This is an excellent opportunity for citizens and property representatives to react to the proposal and help refine the Plan. Comments and opinions are welcomed and will be recorded. If you have any questions, please don't hesitate to call me or John Huth at the Planning Commission office at 334-2196. The Boone County Planning Commission prepared the Union Town Plan and related changes to the Boone County Zoning Regulations and the Boone County Zoning Map during 1998. The Plan was presented at a formal public hearing on Monday, October 26, 1998, in the auditorium of Ryle High School. Several points of the Plan were criticized at the October public hearing, and the Planning Commission has since directed the Long Range Planning Committee, comprised of five Planning Commissioners, to begin the process afresh. Most of the Plans criticism centers around residential densities and several design issues, such as architecture and green space. At the October public hearing, many in attendance suggested the formation of a Citizen/Property Owner committee to work through the issues that were raised. The Long Range Planning Committee has determined this to be the best planning approach for the Union Town Plan. It is important to note that the Planning Commission is not starting the entire process over, but will use the work that was accomplished in 1998 to provide a starting place. The process will be designed to make sure that a strong consensus is reached regarding the Union Town Plan before presenting a revised Plan for action by the Planning Commission, Boone County Fiscal Court, and City of Union. A Citizen/Property Owner Committee will be responsible for addressing a series of issues raised during the 1998 Union Town Plan process, and reporting or recommending to the five-member Long Range Planning Committee a specific course of action. The Long Range Planning Committee intends to make this a very open, public process, and encourages interested citizens and land owners to largely determine the makeup of the Citizen/Owner Committee. The Long Range Planning Committee suggests that the membership of the Citizen/Owner Committee be approximately twelve to fifteen people and represent a cross section of citizens/land owners including those along the proposed new U.S. 42 route, those west of old U.S. 42, those along the existing Mt. Zion Road corridor, the existing business district, and the southern portion of the Study Area. Membership does not have to be limited to those in the study area, if people from outside the area can constructively contribute to the formation of a plan. We suggest also that the Citizen/Owner Committee require a quorum to proceed at any of its meetings, and that a minimum margin of a vote be established before reaching a recommendation on any particular item. The Citizen/Owner Committee meetings will be public meetings and open to anyone interested or affected by the Plan. There will likely be three to five of these meetings to work out the issues. Again, the Long Range Planning Committee intends to take its time and make sure that a consensus is reached on all issues before moving ahead with adoption of any plans. This letter is a formal request for volunteers to serve on such a Citizen/Owner Committee. If you want to make a commitment to serve on this Committee, or want to suggest someone for the Committee, please respond to the Planning Commission staff in writing, by phone, FAX, or E-mail within the next week. Please tell us your particular reason or interest and what benefits you can bring to the Committee. Based on the response to this letter and other suggestions that we receive, the City of Union and a Boone County Fiscal Court representative will help us determine how to put the Committee together. The Citizen/Owner Committee process anticipates achieving a consensus on the issues over a several month period and scheduling a public hearing when the Long Range Planning Committee determines that the Union Town Plan is ready to be presented. If you cannot make meetings, you will be able to review the minutes and other information on our Web site. Our address is www.boonecountyky.org. If you have any questions, dont hesitate to call me or John Huth at the Planning Commission office. Should we establish a formal Union town center that has a mixture of commercial, residential, and public land uses? Do you believe that commercial development should occur along the new U.S. 42 corridor? Are you in support of the split road concept where the northbound and southbound lanes of new U.S. 42 surround the town center and new development? Do you think that attached town houses represents an appropriate density for areas along the new road? Do you feel it is important to keep the rural view along old U.S. 42? If so, how do you think this should be accomplished? Would you like to see design controls for commercial land uses (architecture, setbacks, signage, building materials)? Is it important to control the placement or appearance of homes along major roads? How do you feel this should be done? Name one or more examples of the type, design, and density of residential (either in Boone County or outside the county) that you would like to see for Union. How important is it to preserve green space within developments? Do you have a suggestion on how to accomplish this that may be acceptable to the development community? In general, do you feel that strict development controls increase property values or decrease property values? Should there be some residential design controls such as limiting the amount of certain building materials, hiding utility boxes, roof design, front porches, or which way garage doors face? If so, which of these items or others would you suggest? Should there be a lifestyle theme for Union, such as horse paths, or golf course, or central hiking paths, or architecture? If so, what? KZF Incorporated Marketing Developments Inc.
Long ago cleared of forest, the rolling pasture-land of Union has provided for generations a tranquil landscape, a retreat for those seeking a different place to live and raise their families. Union's peaceful country setting is why many have lived and moved here. Common urban sprawl is now at Union's doorstep along U.S. 42. At this critical point in time a new vision can unfold that preserves the heritage of that pastoral landscape and in so doing, enrich forever the creation of a unique place. A town of pasture-lands and parks will be rare in Boone County years from now, this planning effort will create lasting value through time. The vision set forth in Union today will be remembered generations ahead for creating a new suburban retreat... a pastoral setting to live, work and play... a Country Village. This master plan provides that vision. The City of Union and Boone County comprise one of the fastest growing regions in the Greater Cincinnati Metropolitan area. Located in northern Kentucky, home of the areaís international and regional airport, Boone County is easily accessed by three major interstate expressway systems: I-75, I-71, and I-275. The uniqueness of Boone County is characterized by the rolling topography found south of Florence on U.S. 42. Within the Union Town Study Area, U.S. 42 is currently a two lane rural road characterized by pasture-land, horse farms with white rail fences and low density residential development around the City of Union. The character of the center of the City of Union reflects the small community and neighborhood business district currently present. The pastoral landscape will be altered when the Kentucky Transportation Cabinetís decision to improve U.S. 42 as a five-lane highway through Union commences. North of Union, where five lane improvements have already been made, commercial and residential sprawl characterize the U.S. 42 corridor. The Boone County Planning Commission, through the Comprehensive Plan of 1995, identified the Union area as a unique place deserving special study to preserve both the natural and scenic qualities. The new U.S. 42 alignment has served as a catalyst for further definition of the Comprehensive Plan that would promote quality development as well as offer a mix of housing types and opportunity to develop a mixed use Town Center. The recommendations contained in the 1995 Boone County Comprehensive Plan provide a framework for this more specific Union Town Plan. This Land Use Plan anticipates the development pressures associated with new road construction in the unincorporated areas of Boone County and the City of Union affected by the new U.S. 42 alignment. Through numerous community meetings with property owners, the Union Town Technical Advisory Committee, officials from the City of Union and Boone County Planning Commission, the consultant team of Myers Schmalenberger Meisner received extensive public input to help guide the planning process. The information obtained in the meetings provided the basis for a Land Use Plan. The Land Use Plan brings value to future development by recommending clustering of residential densities to preserve open space and natural features, and concentrating commercial activity in the Town Center. The green spaces created in these ways will link the community together. The Plan indicates that development can occur in a meaningful way that will bring increased value to the property, yet with sensitivity to the landscape. The result is a plan that serves the best interests of the community as it strives to create a unique place in Boone County that does not replicate past development patterns typical in other parts of the county. This Plan proposes increased densities over existing zoning in most cases, but recognizes that this increased density is only appropriate if located and designed properly. To achieve this, the Union Town Plan is accompanied by unique zoning regulations and design standards. Without these measures, the pastoral and small town character that creates the opportunity for quality development will be lost. In order to create a successful plan it was crucial to invite participation from the whole community. The public process involved several meetings that included property owners in the study area as well as other interested individuals and community leaders. The Myers Schmalenberger Meisner Team conducted three public workshops with property owners in late April and early May, 1998. These meetings solicited opinions about future visions of Union, land use and other concerns once the new U.S. 42 was constructed. Place a high value on the pastoral, scenic quality of old U.S. 42. Incorporate additional parkland for bike riding, hiking, and horseback riding. Preserve/create green spaces and trees, especially along roads. Help mitigate flooding and drainage problems. Green spaces and pathways should link the Town Center to residential areas, churches and schools. 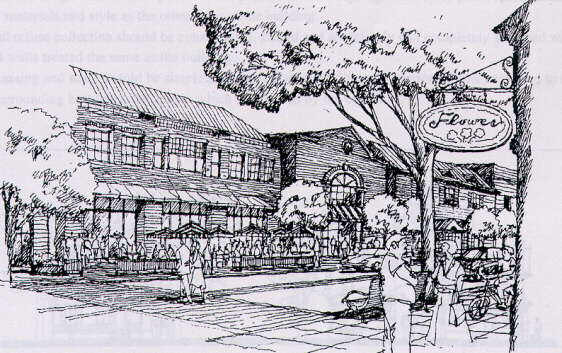 Union should be distinctive and unique, with many participants envisioning an expanded downtown Union with a "quaint Town Center" where business would be centrally located with a mixture of land uses. Formal gathering places and parks should be in the Town Center. New Town Center development should share common design and architectural styles and "look like Kentucky." There should be signage controls. There should not be industrial developments, "big box" retail development or another "Dream Street" district. Existing conditions to identify land use types and locations, historic structures and proposed road alignment. Existing vegetation to identify where mature tree stands are located. Soils conditions to identify poor building locations. Topography and surface hydrology to identify slope and drainage issues that effect development. A visual assessment to locate where key views, visual resources and important visual features are located. And a summary analysis that identifies areas that are suitable for development and also identifies environmentally sensitive areas due to hydrology, slope and soils issues that should not be developed. Additionally, water and sewers were also reviewed. Sewers will be available for new development and for adjacent existing residential developments. 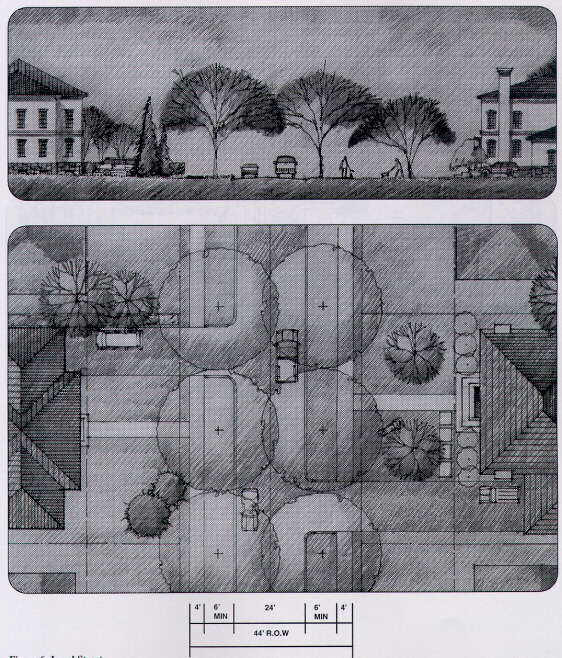 Three Conceptual Land Use Plans were presented to Union area property owners and citizens on June 8, 1998. Each plan represented a different balance of green space to land use development and densities. Three alternative schemes for the realignment of U.S. 42 were also shown as part of the Conceptual Plans. Most attendees (75%) supported the lower density option illustrating 60% open space/40% development. The concept illustrating 60% development/ 40% green space was favored by only 17% of those present while only 8% preferred 50% development/50% green space. Density issues of clustering up to 8 units per acre were balanced by many preferring up to one unit per acre. A concentrated Town Center with a mixture of infill commercial, residential and office uses shown in all three concepts was popularly received. Green spaces and pathways were found to be important links between residential areas, institutions and the Town Center in addition to serving as an effective means to control stormwater. 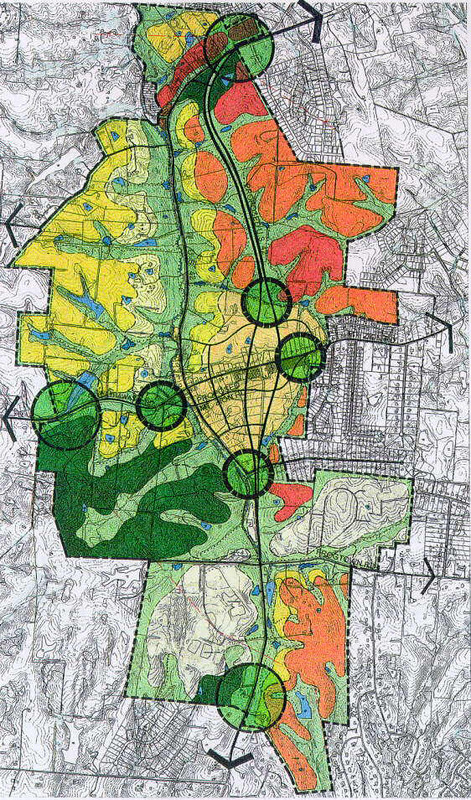 Marketing Developments Inc., a member of the MSM Team, prepared a market analysis for the Union Town Plan area. Their observations indicated the market is over saturated and does not warrant additional commercial uses along new U.S. 42 at this time. This market is currently served by those just outside the study area. They also concluded that even when fully developed, the Union area would not support a continuous commercial strip along the new U.S. 42 and a continuous commercial strip would limit potential values of future housing. retail/commercial should be targeted to the Town Center to create a "sense of place"
The Town Center could possibly evolve with one-way pairs of streets (including Mt. Zion Road). the roadway widens allowing a roadway grid to form. The roadway framework for the Town Center includes the existing Mt. Zion Road, the proposed Mt. Zion Bypass, the new north and south U.S. 42 Bypass lanes and the existing U.S. 42. Comments were solicited on key elements. The majority of the respondents liked the lower density land uses with fewer in favor of the medium and cluster densities. Only a few residents felt the Town Center should be limited in size. Many thought there was no need for an office park. The majority felt the amount of open space and recreation shown on the plan was good, and several suggested that we include more open space. Several respondents related that much of the uniqueness of the Union area is because of its open space. Locating compatible land uses in relationship to one another. Locating higher intensity land uses adjacent to major roads and existing development. Creating a Town Center to concentrate new commercial and residential development. Creating a sense of place by preserving the natural features that are unique and typify Union. 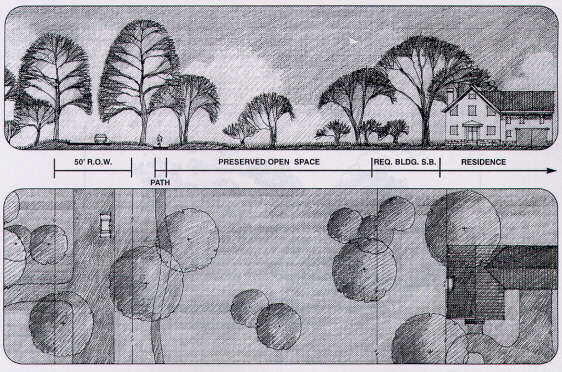 The densities recommended in this plan are not appropriate without the creation and preservation of the open space. The impetus for the Union Town Land Use Plan was the extension of the U.S. 42 improvements through Union. The proposed U.S. 42 corridor right-of-way is currently under final review. The Land Use Plan illustrates U.S. 42 as a divided parkway with a landscaped median separating north and south bound traffic. As the road approaches the Town Center, the north and south bound lanes separate a distance of approximately 750 feet to facilitate a street grid system to form in the future. The north and south bound lanes converge north of Whispering Trail, just before U.S. 42 realigns with the existing right-of-way. The existing U.S. 42 will become a minor arterial, handling local traffic through a scenic corridor that preserves the pastoral landscape. Mt. Zion Road serves as the primary east-west arterial connecting I-75 through Union to western Boone County. As Boone County continues to grow, the ability of Mt. Zion Road to handle the traffic volume has led the Kentucky Transportation Cabinet to examine options to create a more traffic effective bypass to Mt. Zion Road. The Plan shows a Mt. Zion bypass south of the existing Mt. Zion Road. This arrangement together with the proposed U.S. 42 right-of-way and the existing U.S. 42, form the street grid pattern for a Town Center to evolve over time. The existing and proposed Mt. Zion Roads can be built to accommodate 2-way traffic, but could evolve to one-way pairs as traffic demands and the Town Center develops. Views of rolling countryside and Fowlers Creek as seen from the existing U.S. 42 form a unique and distinguishing characteristic of the Union area. This pastoral landscape sets Union apart from development along the U.S. 42 corridor north of Union. To add long term value to the plan and preserve this natural feature, a pastoral view corridor boundary was established. The boundary along old U.S. 42 takes into account the topography, creeks, vegetation and historic structures. The boundary requires land within this designation and in the primary green space be permanently left in an open space setback. Development can occur, but it must be setback from the right-of-way as shown on the Land Use Plan. The open space identified on the Land Use Plan not only preserves the pastoral landscape, but also protects steep slopes and natural drainage ways. These areas are not to be developed except for storm water management and recreational uses listed below. Reserving the primary green space as designated open space justifies the densities recommended in the Land Use Plan. Otherwise, the densities would be inappropriate. The primary green space also serves as a buffer between dissimilar land uses. Open space not depicted on the Plan would include common open space within development areas and civic space. Natural drainage ways, existing creeks and streams are protected within the primary green space. This enables collective storm water management for proposed development and the possibilities of additional storm water detention in the drainage way. A minimum of a 25-foot corridor on each side of the centerline of the drainage way is recommended to accomplish this. The primary open space corridors will be duly utilized as areas for non-motorized pedestrian (except wheelchairs) activities such as walking and bicycling paths. These pathways are intended to link the residential areas with the schools, churches, the neighborhood commercial and office activities in the Town Center, the new public library and other land uses as they develop. The basis for this density is the preservation of the pastoral landscape along existing U.S. 42. The zoning allows for estate lots of 5 acres per house on the west side and 3 acres per house on the east side. The lots will extend into the primary green space to the right-of-way along U.S. 42. However, land within the pastoral landscape/primary green space will be permanently green. New construction on these lots should be behind the required setback line. Access will be limited to controlled locations. The provision of this permanent green space adds value to the unique rural landscape that is Union. While allowing new development, it protects the important visual quality and manages flooding issues associated with Fowlers Creek and other drainage ways. Low density residential development of single family houses on one acre lots are shown on the Land Use Plan, west of the 5 acre rural density residential zone. Low density residential subdivisions will continue to preserve the rolling landscape and incorporate primary green space. This land use serves as a transitional land use between the existing U.S. 42 corridor and moderate density that may occur in future development further west and southeast. Moderate density residential development is shown on the Land Use Plan on relatively flat areas east and in close proximity to the new U.S. 42 and the Town Center as a transitional land use. New development of single family detached houses and town house style units can be built at 3 dwellings per acre. 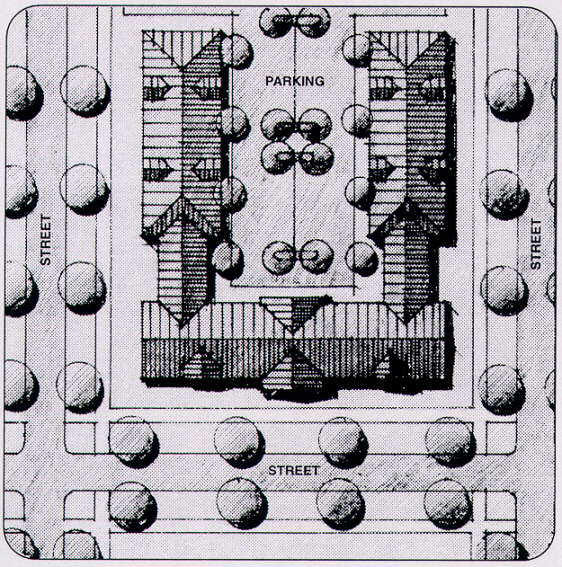 Moderate density residential dwellings will be on smaller lots with the building setback line close to the street. Attached single family houses, zero lot line houses, garden houses, townhouses that are characterized as cluster density are shown on developable land in close proximity to the new U.S. 42 and the Town Center. Clustering 6 dwelling units per acre on small lots will allow creative urban density while preserving green space. Figure 2 (Figure 2 Town Center) illustrates an enlargement of the Town Center district. It is comprised of existing buildings and new infill development that will occur over time. Land uses within the Town Center will evolve to become a true mixture of residential townhouses, cluster, and single family houses situated in an urban framework that may include neighborhood retail services and commercial uses on the same block. The existing U.S. 42 and proposed split U.S. 42, and the existing and proposed Mt. Zion Roads will form the basis for a network of roads for new development to occur. Additional streets will provide circulation within the Town Center area. Central to preserving the sense of place and to add value over time is a continuation of the primary green space that will link other neighborhoods and land uses to the Town Center. 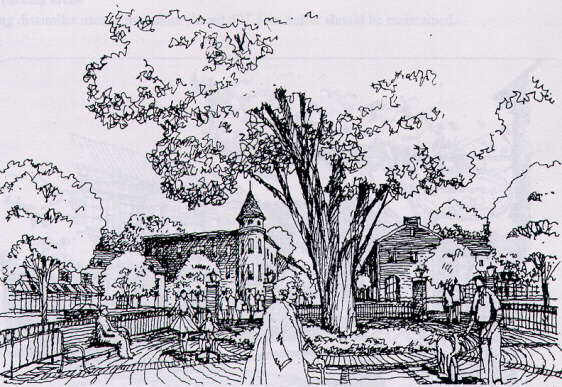 The "Town Green" around the Union City building can evolve as a central gathering place for Union. The existing commercial zones in the Union Town Plan study area not within the Town Center are classified as office and neighborhood retail uses. Over time, additions and alterations will conform to the Union Town Plan in a non-continuous development pattern. Schools, churches and public buildings are important to the identity of a community. The locations of existing institutions are identified on the Land Use Plan. All of the uses are expected to grow with the future growth of Union. The land designated in the Plan as agricultural/open space supports the quality of the community environment Union is trying to build upon. As northern Kentucky rapidly suburbanizes, pressure for building sites often remove land from agricultural use and neglect the creation of preserved open space. This plan has identified opportunities where greenspace can be protected for generations to come. Development and land values are influenced to a great extent by access and visibility. Gateways occur in the Union Town Plan area where roadways create access and unique visibility, at the entries to City and Town Center. These areas may have special landscape features or view opportunities. The Union Town Plan provides an overall land use, planning and urban design framework for a large part of the City of Union and an adjacent area of unincorporated Boone County. It recognizes that both public and private investment will occur over time enabling Union to create a distinctive new place within Boone County. These design guidelines ensure that development decisions complement each other. In general, the guidelines establish a consistent context for development while allowing individual expression for each designer and developer. These guidelines address roadways, open space, architecture, building orientation, landscaping, signage and land uses. Standards have been included within the Zoning Regulations to help implement this Plan. The development review process is described in the Zoning Regulations. The permanent open space component of the Union Town Plan is a major element influenced by the commitment to preserve the rural pastoral and scenic landscape quality of the Union area. This Plan recommends preserving the natural drainage ways and slopes as part of a regional storm water management system and for hillside preservation. Furthermore, this Plan encourages developers to preserve additional interior green space through use of clustering. The different functions of open space are described in detail under the Open Space section. This Plan also addresses in detail how buildings and infrastructure should be designed in relation to one another. The proposed designs for the U.S. 42 and Mt. Zion Road bypass offer a unique opportunity to create a street framework and a sense of place for Unionís Town Center. This roadway system will enable a mixture of residential, office, and commercial development to consolidate in the Union Town Center over time. Narrowing the pavement width, providing on street parking and streetscape improvements will distinguish Union and particularly the Town Center from the approaches. Pedestrian circulation and streetscape improvements within the right-of-way should link and inter-connect the residential developments and open space pathways to the Town Center, schools and churches in the area. Consideration must be given in the design of the streets to follow the rolling topography to minimize grading and excessive storm water run-off. The road system within the Union Town Plan can be described as a hierarchy of arterials, collectors, local streets, accesses streets and alleys within the development areas of the Plan. Dimensioned prototypical plans and road cross sections are included as guidelines. **Additional right-of-way may be required if turning lanes are needed. Arterial streets are the principal roads within the community such as Hathaway Road, Mt. Zion Road, and U.S. 42. The construction of the U.S. 42 Bypass will create a new arterial corridor through the center of Union tying into the existing U.S. 42 right-of-way. When the U.S. 42 Bypass is complete, the existing portion of U.S. 42 replaced by the relocated arterial, should become a minor arterial road. The potential Mt. Zion Road Bypass will replace the existing Mt. Zion Road from old U.S. 42 east to U.S. 42 Bypass as an arterial road. The existing Mt. Zion Road will become a minor arterial between old U.S. 42 and the U.S. 42 Bypass. The construction of these new roads should define the core framework of Unionís Town Center. Based on future growth in the Town Center, Mt. Zion Road and Mt. Zion Bypass can in the future, become one-way street pairs connected by local streets. Figure 3 illustrates the arterial fronting residential uses and open space. Collector Streets are intended to provide a second road category. They collect and distribute traffic primarily from sub-collector and local streets to arterial streets. As illustrated on Figure 4, the 32-foot pavement width and 40-foot setback from the right-of-way line provides space for higher traffic volumes. On-street parking is permitted on one side of the street. Individual residential driveways may be permitted on collector streets within low density and in rural residential areas. A 60-foot right-of-way width is recommended. Sub-collectors illustrated below in Figure 5 are to be used within the Town Center, office park and residential development areas. These roadways have a recommended right-of-way width of 50 feet with pavements widths of 24 feet. The designation should be based upon the level of anticipated traffic to be served, which in turn is dependent upon the number of homes served. Local streets shown below in Figure 6 are to be used within the Town Center, office park and residential development areas. These roadways have a recommended right-of-way width of 44 feet with pavements widths of 24 feet. The designation should be based upon the level of anticipated traffic to be served, which in turn is dependent upon the number of houses served. The alley, shown below, is intended for use within the Town Center, cluster and moderate density residential areas to provide access to rear lot garages. In residential districts alleys are highly encouraged to minimize garage doors fronting residential streets. Alleys should contain telephone and electric lines as well as garbage collection. Within the Town Center, alleys can also link parking areas. right-of-way on the east side. This setback will vary according to the green space depicted on the Master Plan. Existing structures which do not meet the new setback standards, are allowed to maintain their existing setback. New subdivision entrances are not appropriate on existing Rural Roadways. Lamp posts, signage, utility poles, traffic control devices, parking meters, etc. Sidewalks in the Town Center and key intersections should be paved in brick, stone or cobble compatible with the Union Town Center materials. All other walks should be concrete. Streetlights are required. 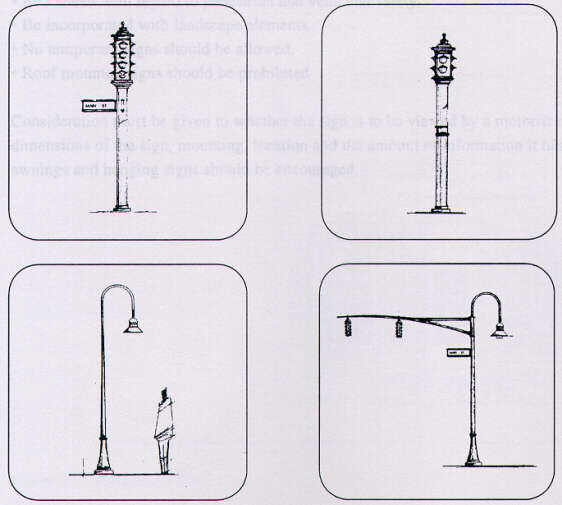 Illustrated below are examples of ornamental streetlights that provide consistent levels of lighting when placed at strategic locations. Lighting should be evaluated based upon the appropriateness of the fixture (height, style, and color). Height and light level of the light fixtures should reflect location in regard to residential, Town Center or road intersection. Lighting levels should be shielded and take into consideration both the ambiance of the space and safety for vehicles and pedestrian. A unified signage program should be developed for the entire Union Town Plan area. Elements should include: attractive, coordinated, well-designed signs that have an impact on both the local community and businesses. Signage should provide a defined identification between residential neighborhoods and Town Center; creating a pleasing environment that attracts people and enhances the image of the community. A signage plan hierarchy is related through color, shape, size, form, and typeface, logos, materials and lighting. The chart below provides an example of how the hierarchy is structured. Use no more than 3 colors. Be sized to be in proper scale with the building it identifies. In general, be in keeping with the streetscape. If illuminated, use external sign lighting from concealed sources. Be compatible in character within the context of the community. Use wood or metal materials. Not exceed the height or width of a building or is roof mounted. Be located with regard to pedestrian and vehicular safety. Be incorporated with landscape elements. No temporary signs should be allowed. Consideration must be given to whether the sign is to be viewed by a motorist or a pedestrian, which effects the overall dimensions of the sign, mounting, location and the amount of information it has to convey. The use of flags, banners, awnings and hanging signs should be encouraged. Examples of signs include wall signs: window painted signs, neon window signs custom made to accent business or building. Free standing signs are best for large setbacks, and should be ground mounted as illustrated below. Informational band signs illustrated below, are generally 18-26 inches in vertical dimension and are located between first and second floors on buildings. It is recommended or encouraged that utilities be placed underground. Telephone, electric, cable service lines and garbage collection should be provided to new development along rear property lines or Alley Streets. This will reduce visual clutter along the sidewalk. The rural farm fence reminiscent of horse farm country is currently present in the Union area. Continued use of a 3 or 4 rail post and board style horse fence illustrated below is encouraged. The use of post-and-rail, wood or picket fences would also be in keeping with the pastoral landscape. Fence height should be limited to 4.5 feet. Chain-link and vinyl fences are strongly discouraged. Four properties in the study area are listed on the National Register of Historic Places. Several additional properties have been inventoried as Kentucky Historic Resources by the Boone County Historic Preservation Office. All historic properties including outbuildings contribute to Unionís sense of place. The existing historic and National Register properties should be maintained and where appropriate over time allowed to convert to other uses. Architectural and stylistic references from historic buildings and Unionís heritage should be included in new development. New development with a relevant historic architectural theme is encouraged. A Field Guide to American Houses can serve as a reference book for appropriate architectural eraís in Union. The establishment of a Union Town Review Board (UTRB) will be essential to determining the appropriateness of each development proposal and consistency with the Union Town Plan. To ensure the proposed land use is consistent with the Plan, a review will be performed by the Long Range Planning Committee of the Boone County Planning Commission. The committee will recommend to the full Commission which review process each development proposal will have to follow. If the development proposal is in accordance with the Planóit will proceed directly to site plan review at which time the Union Town Review Board will review all site plans, subdivision plans, architectural design plans, landscaping plans, and signage plans, conversion or expansion of existing uses/buildings. Boone County Planning Commission will provide technical support to the Board. Site Plan review of Subdivision Plat review and Architectural Design review must occur simultaneously. There are two (2) forms of open space presented in the Union Town Plan. The first is primary green space shown on the Plan and designed to preserve part of the pastoral landscape found to be critical. These are stream corridors, rural road corridors, wetlands, flood prone areas, poor soils areas, woodlands and slopes. The second is open space that is to be provided within developments. 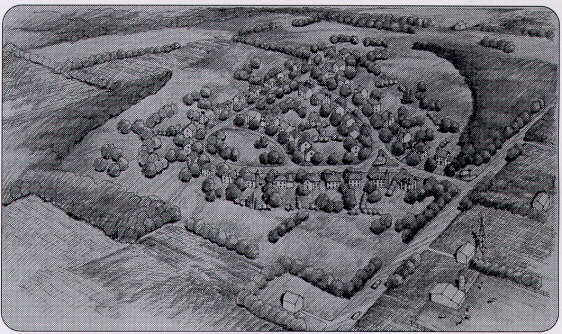 The preservation of open space and rural character is a goal of the Plan identified early in the process. Strategies to achieve this goal include "clustering" development to maximize the open space. Stream corridors are a major element of the plan. The preservation of drainage ways, creeks and stream corridors achieves several goals: maintaining the natural visual qualities of the landscape, storm water management, natural habitat preservation, vegetation and open space for hiking and biking trails. It is recommended that hiking, riding and bicycle paths be constructed through these corridors as part of abutting development or as civic improvements. Motorized vehicles should not be permitted on these paths, with the exception of wheelchairs. Land along Fowlers Creek should be left in its natural state. Where this is not the current condition, it should revert to a more natural state over time. Existing homes and their yards within the stream open space corridor will be permitted to remain. Construction of new houses should occur according to specified setback lines as shown on Figure 13 on the following page. 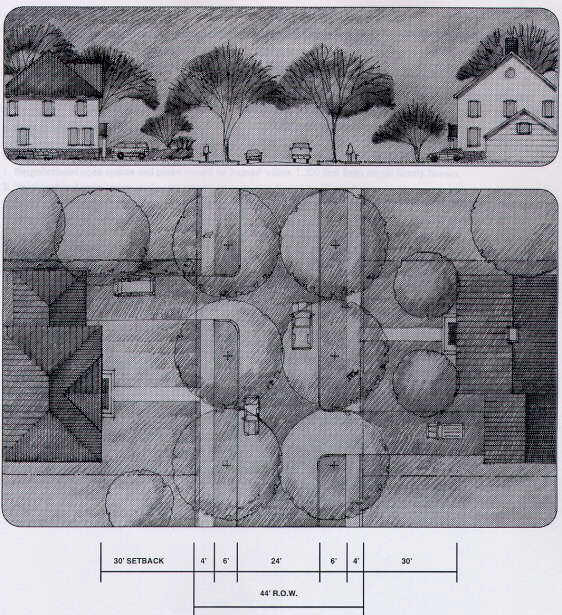 The Plan encourages negotiating a right-of-access for the path to be sited in such a way as to minimize impact upon the privacy of the abutting houses. Stream corridor open space can be achieved by combinations of flood use regulations and flood protections, easements, clustering development and public purchase such as; donation of property, transfer of development rights and open space zoning. This area depicted on the Land Use Plan is minimally 25 feet on each side of the drainage way center line. House must face old U.S. 42. Rural road-related open space protects and preserves the pastoral landscape along old U.S. 42 and other designated roadways. It is essential open space along roads be protected and preserved in their native wooded, farmland or grassland, or allowed to revert to that state. This determination should be made based upon topography, current conditions and future abutting uses. Open spaces not within the stream corridor or part of the rural roads should be incorporated within individual development areas. 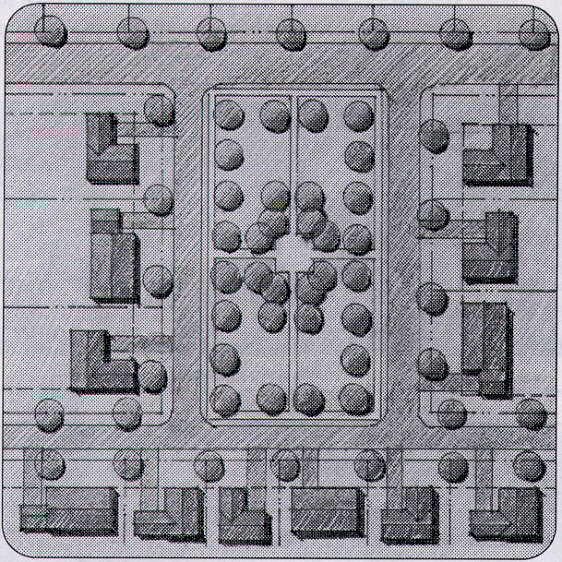 These open spaces should be created by clustering development or arranging houses to front a green space as shown in Figure 14. It is particularly important to have open space within developments inter-connect with the stream and rural road spaces. The provision of formal public open space within each development should be required. The rural residential district is intended for low-density single family residential development and estate farms within a context of large open spaces and agricultural uses. Primarily located along the old U.S. 42 corridor, the 3 acre and 5 acre lots with deep setback lines will help preserve the pastoral landscape frontage. The front portion of these lots will preserve open space and also serve as a storm water management zone. 1. To preserve the pastoral landscape, all new buildings will respect the required setbacks that vary according to topographical and other natural features. These setbacks are depicted on the Plan. 2. New roads should minimize earthwork by following the existing topography, rolling hills and drainage ways. 3. Two-way streets with a 50-foot right-of-way without parking or curbs are encouraged. 4. Narrower streets are encouraged where appropriate to promote a pedestrian friendly scale. 5. Streets should be arranged in simple connecting patterns following topography. 6. Cul-de-sacs are not recommended. 7. Pedestrian access must be provided between adjoining streets, cul-de-sacs and open spaces. 8. Bike paths and sidewalks can be combined for pedestrian use, as appropriate. 1. On-street parking is discouraged for residents. 2. All driveway curb cuts should be constructed to accommodate a maximum 12-foot driveway at the right-of-way line. 1. The natural landscape and open space should be incorporated into residential design and development. 2. In developments of 10 acres or more, at least 20% of the gross developed land areas should be common open space. 3. Woodlands should be preserved and protected to the greatest extent possible. 4. Flood plain areas should be incorporated into the open space. 5. All streams, creeks, and drainage ways with a drainage area greater than 40 acres and their riparian corridors should be preserved in their natural state. The corridor should be a minimum of 25 feet wide on each side of the stream or drainage way as depicted on the Land Use Plan. 6. Areas determined as wetlands and floodways should comply with all regulations. 7. Leisure paths and trails should be constructed along creeks and roads in accordance with the Plan. 8. Leisure trails for bicycle and pedestrian walks should be a minimum width of 10 feet with one-foot shoulders on each side. 1. Single-family homes should front onto old U.S. 42. 2. The average single family lot width should vary to take advantage of the natural features. 3. The single family lot area minimum should be 3 acres on the east side of old U.S. 42 and 5 acres on the west side of old U.S. 42 north of the Town Center. Building sites should occur only in the areas identified with the remainder of the lot preserved as primary green space as shown on Figure 16. 4. Existing woodlots and fence rows should be preserved and used to structure rural cluster development. Residential development should be at the "edge" of woodlots and fencerows rather than "in" the woodlots. The existing landscape character should be preserved and used to frame rural cluster development. 5. When abutting dissimilar uses, a minimum 25-foot buffer zone should be maintained. 6. Building setbacks should be within the development area designated on the Plan. 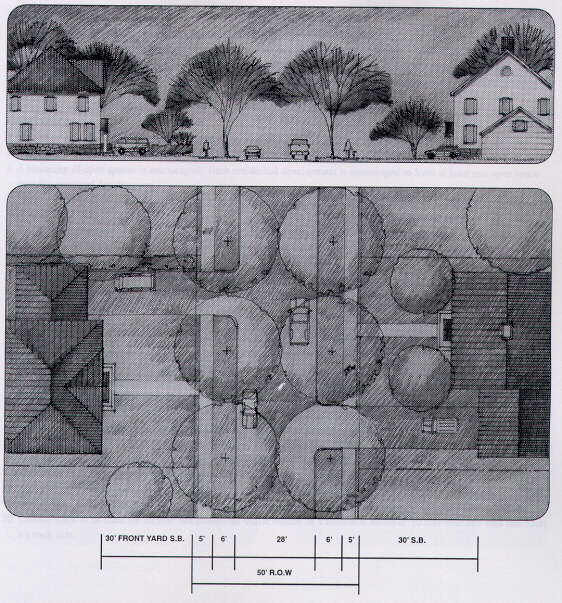 Figure 16: Example of rural estate residential architecture and site orientation. 1. 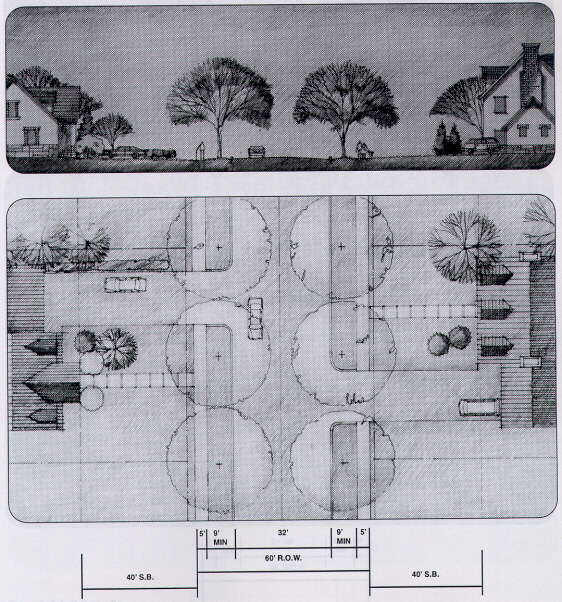 The massing of each house should be simple, relating the house to the natural topography. 2. Sloped and pitched roofs are encouraged. Flat roofs are allowed only with highly detailed or decorative cornices. 3. Front porches are encouraged. 4. Side-loaded and rear entry garages are encouraged. Should a garage face the street, the front facade of the garage must be set back a minimum of 5 feet from the front facade of the house. 5. The maximum width of a garage door, which faces the street, is 10 feet. 6. Building materials should be traditional and natural such as brick, stone, wood, or glass. 7. All elevations of the building should be built of compatible materials. 8. 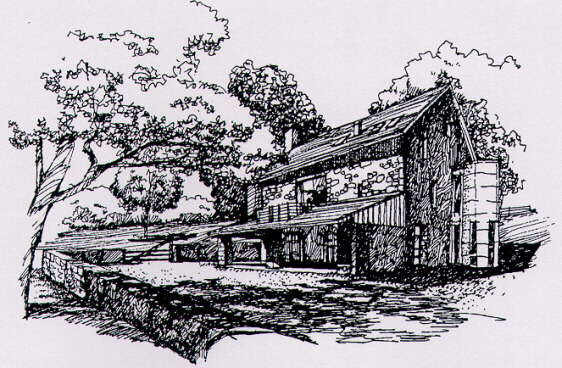 The front elevation of the house should be 2.5 stories maximum building height, and take into account the topography; the rear elevation can be greater in height. 1. Coordinated entry and street signs are encouraged. 2. All entry signage should be ground mounted or set within an entry structure and natural in appearance. 3. Lighting, if appropriate, should be with direct illumination from a shielded light source. 4. Street signs should be simple and legible. Low density residential development is characterized by the clustering of single family detached residences around green spaces to preserve a larger accessible open space. 1. A hierarchy of streets including a collector (illustrated on the next page), sub-collector and local streets should be identified. 3. Narrower streets are encouraged to promote a pedestrian friendly scale. 4. Streets should be arranged in a simple, inter-connecting pattern, respectful of topography. 5. Cul-de-sacs should be discouraged. If cul-de-sacs occur, provide open space or plantings within circle. 6. Streets should be two-way with 5-foot wide sidewalks on both sides of the street setback 5 to 10 feet from the curb line within the right-of-way. 7. Tree lawns should be a minimum of 6 feet in width. 8. Deciduous canopy trees spaced no less than 24 feet and no more than 30 feet on center are to be planted in the right-of-way. 9. Street trees should be a minimum 2.5 inches caliper at breast height at installation. 1. Parking for single family houses is encouraged to occur in side or rear-entry garages. 2. Garage doors should be single bay and not exceed 10 feet in width. 3. On-street parking is recommended for visitors and short term parking. 4. All driveway curb cuts should be constructed to accommodate a maximum 12-foot wide driveway at the right-of-way line. 1. Neighborhood open spaces and parks should be located within walking distance from single family houses. 2. Neighborhood open spaces and parks should range in size from 1 to 10 acres. 3. A hierarchy of open spaces is encouraged. Each residential development is encouraged to have at least one open space near the center of development. 1. 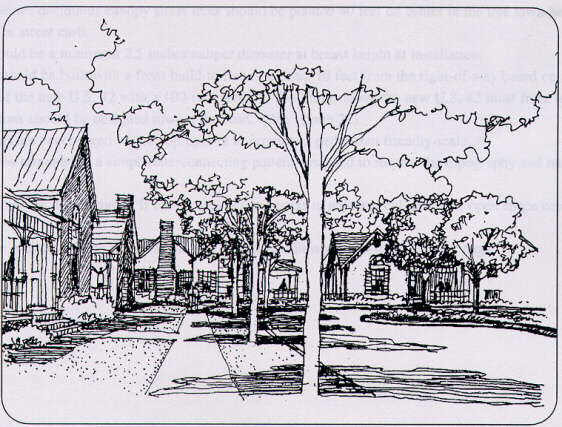 Single family houses should front onto public streets or be clustered around common open spaces. 2. The maximum single family lot width should vary to work with the existing topography, minimize roads and create green space. 3. The minimum single family lot should not be less than one-half acre (net density). 4. When abutting dissimilar uses, a minimum 25-foot buffer zone should be maintained. 2. The UTRB will review site plans for each development to ensure development open space is provided. For developments of 10 acres or more, at least 5% of the gross developed land areas should be common open space. 4. Flood plain areas should be incorporated into the open space areas as much as possible. 5. All streams, creeks and drainage ways with a drainage area greater than 40 acres and their riparian corridors should be preserved in their natural state. 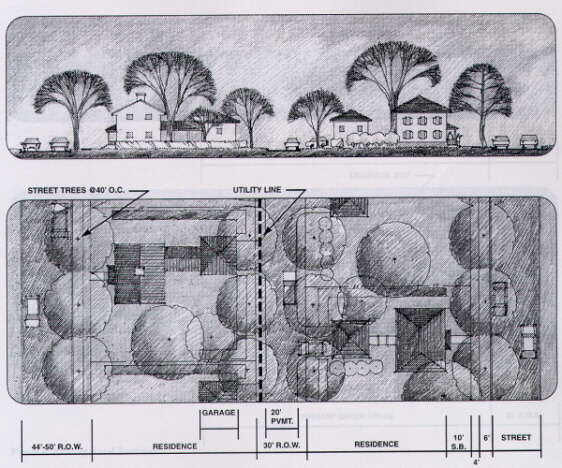 The corridor should be a minimum of 25 feet wide on each side of the stream or as depicted on the Land Use Plan. 6. Areas determined as wetlands or flood plain, should be preserved in compliance with all regulation. 7. Internal paths or sidewalks should be linked to external sidewalks or trails. 8. Sidewalks are required along all public rights-of-way at a minimum width of 5 feet. 9. Leisure paths and trails should be constructed along drainage ways and roads in accordance with the Plan. 10. Leisure trails to be used for bicycle and pedestrian traffic should be a minimum width of 10 feet with one-foot shoulders on each side. 2. Buildings should be a minimum of 1.5 stories and a maximum of 3 stories. 3. Building massing should be appropriate to pre-1940 traditional American Architectural forms, scale and massing of the surrounding buildings and setbacks. 4. Modern architectural styles will be reviewed by the UTRB on a case by case basis. 5. Simple gabled roof forms and dormers are encouraged. Flat roofs are allowed only with highly detailed or decorative cornices. 6. Front porches are encouraged. 7. Side-loaded and rear entry garages are encouraged. 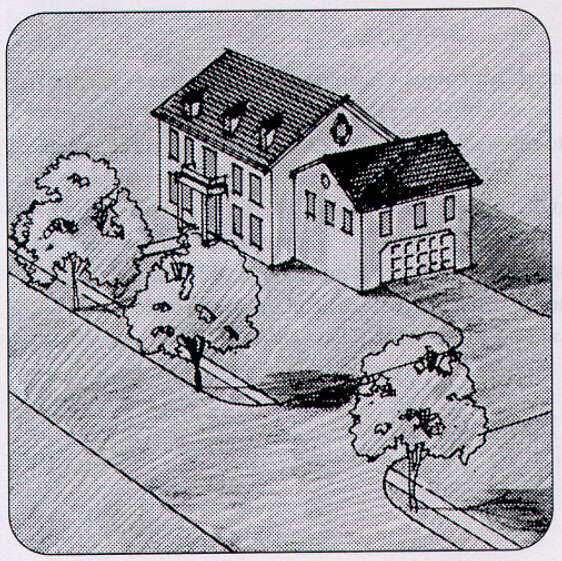 As shown below on Figure 18, when a garage faces the street, the garage must be setback a minimum of 5 feet from the front facade of the house. 8. The maximum width of a garage door, which faces the street, is 10 feet. 9. Building materials should be traditional and natural in appearance, such as brick, stone, wood, or glass. 10. Any side of a building, which faces a public street right-of-way or green space, should be of the same materials as the other sides of the building. 1. Coordinated entry and street signage is encouraged. 2. All entry signage should be ground mounted or set in an entry structure and natural in appearance. Moderate density residential is characterized by smaller lots with residential units clustered around neighborhood green space. 1. There is a hierarchy of streets including a collector, sub-collector and local streets (illustrated on the following page), and lanes as identified previously. 3. Narrower streets are encouraged where appropriate to promote a pedestrian friendly scale. 4. Alleys may be used as driving aisles to access parking. 5. Streets should be two-way with 5-foot wide sidewalks on both sides of the street setback 6 feet from the curb line within the right-of-way. 6. 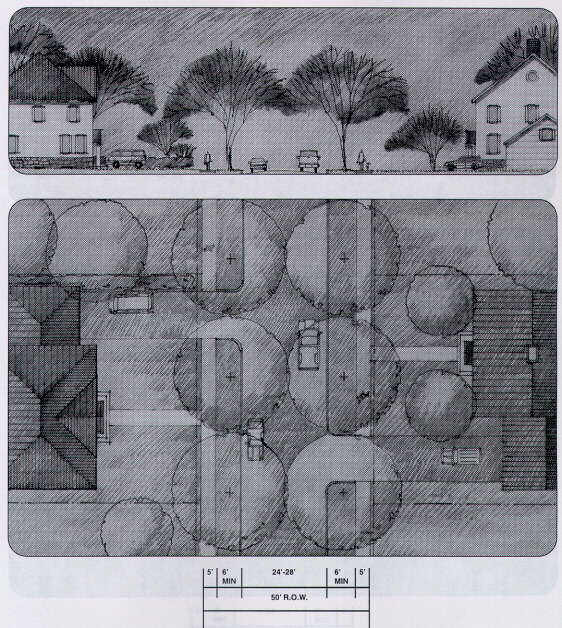 Approved species deciduous canopy street trees should be planted 24 to 30 feet on center in the tree lawn between the sidewalk and the street curb. 7. Street trees should be a minimum 2.5 inches caliper at breast height at installation. 8. Streets should be arranged in a simple interconnecting pattern. 9. Cul-de-sacs should be discouraged. If cul-de-sacs occur, access to adjacent open space needs to be facilitated. 1. Parking for single family houses is encouraged to occur in side or rear-entry garages. On-street parking and designated off-street parking should be provided for visitors. 2. If a garage faces the street it must be 10 feet behind the front facade of the house. 3. Parking for single family houses can also occur in rear lot garages accessible by alleys. 4. All driveway curb cuts should be constructed to accommodate a maximum 12-foot driveway at the right-of-way line. 5. No parking or drive aisles should be permitted in any building setback other than in the case of drive aisles necessary to grant ingress and egress. 1. Neighborhood open spaces and parks should be located within 1,200 feet from single family houses. 1. Single family houses should front onto public streets. 2. The maximum lot width should vary to work with the existing topography, minimize roads and create green space. 3. The single family lot should be a minimum of 6,500 square feet net. 1. Neighborhood open space/parks should be located within easy walking distance of all dwelling units. 2. Open space is encouraged in the form of small common green spaces interconnected by a trail or path system. 3. The natural landscape and open space should be incorporated into residential design and development. 4. The UTRB will review site plans for each development to ensure development open space is provided. For developments of 10 acres or more, at least 5% of the gross developed land areas should be common open space. 5. Woodlands should be preserved and protected to the greatest extent possible. 6. Flood plain areas should be incorporated into the open space areas as much as possible. 7. All streams, creeks and drainage ways with a drainage area greater than 40 acres and their riparian corridors should be preserved in their natural state. 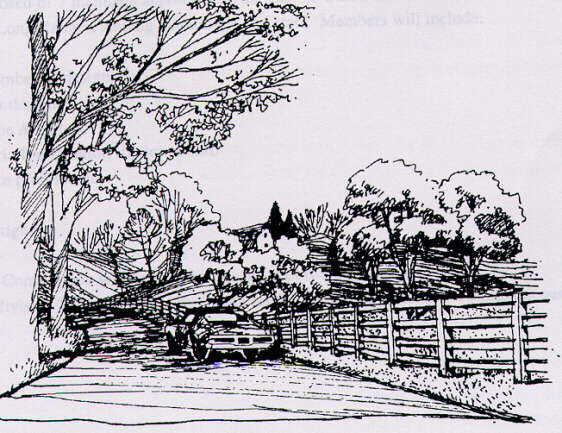 The corridor should be a minimum width of 25 feet wide on each side of the stream or as depicted on the Land Use Plan. 8. Areas determined as wetlands and floodways should be preserved in compliance with all regulations. 9. Internal paths or sidewalks should be linked to external sidewalks or trails. 10. Sidewalks are required along all public right-of-way at a minimum width of 5 feet. 11. Leisure paths and trails should be constructed along drainage ways and roads in accordance with the plan as illustrated below. 12. Leisure trails to be used for bicycle and pedestrian traffic should be a minimum width of 10 feet with one-foot shoulders on each side. 1. The massing of each house should be simple and relate to the existing topography. 2. Building design should be based on traditional American style prior to 1940. 3. Modern architectural styles will be review by the UTRB on a case by case basis. 4. Buildings should be a minimum of 1.5 stories and a maximum of 3 stories. 5. Building massing should be appropriate to traditional American Architectural forms, scale and massing of the surrounding buildings and setbacks. 6. Simple gabled roof forms and dormers are encouraged as illustrated below. Flat roofs are allowed only with highly detailed or decorative cornices. 7. Side and rear entry garages are encouraged. When a garage faces the street, the garage must be set back a minimum of 10 feet from the front facade of the house. 9. Building materials should be traditional and natural such as brick, stone, wood or glass. 10. Any side of a building, which faces a public street right-of-way or green space, should be of the same materials and styles as the other sides of the building. 1. Coordinated entry and street signage are encouraged. The clustering of attached, garden houses, townhouses, detached single family and zero lot line residential uses in close proximity to each other is encouraged to promote a more compact single family residential environment. Cluster residential is envisioned as an area of clustered single family detached homes and attached townhouses located as per the plan and/or within walking distance of the mixed-use town center and developed at a slightly higher density than other residential areas. Density: Six dwelling units per acre gross. 1. There is a hierarchy of streets including a collector, sub-collector and local streets, and alleys as identified and illustrated on the following page. 2. All buildings should be built to face the front yard setback lines established 5 to 10 feet from the right-of-way. 3. Streets should be two-way with 5-foot wide sidewalks on both sides of the street set back 6 feet from the curb line within the right-of-way. 4. Appropriate species deciduous canopy street trees should be planted 40 feet on center in the tree lawn between the sidewalk and the street curb. 5. Street trees should be a minimum 2.5 inches caliper diameter at breast height at installation. 7. Narrower streets are encouraged where appropriate to promote a pedestrian friendly scale. 8. Streets should be arranged in a simple interconnecting pattern designed to respect the topography and natural drainage systems. 9. Cul-de-sacs should be discouraged. If cul-de-sacs occur, access to adjacent cul-de-sac or open space needs to be facilitated. 10. Alleys may be used as driving to access parking garages as illustrated on the following page. 1. Parking for cluster residential is encouraged in rear lot garages accessible by service alleys. 2. On-street parking may be provided for visitors and short term parking areas provided. 3. All driveway curb cuts should be constructed to accommodate a maximum 12-foot driveway at the right-of-way line. 4. No parking or drive aisles should be permitted in any pavement setback other than in the case of drive aisles necessary to grant ingress and egress. 5. If a garage faces the street it must be setback 10 feet further than the front facade of the house. 6. When abutting dissimilar uses, a minimum 25-foot buffer zone should be maintained. 1. Neighborhood parks should be located within easy walking distances of single family houses. 2. Neighborhood parks should range in size from 1 to 10 acres. 3. For developments over 50 lots, a minimum amount of space should be public/civic space. This requirement will be reviewed by the UTRB. 1. Neighborhood parks should be located within 1,200 feet of all dwelling units. 4. In developments of 20 acres or more, at least 20% of the gross developed land areas should be common open space. 7. All streams, creeks and drainage ways with a drainage area greater then 40 acres and their riparian corridors should be preserved in their natural state. 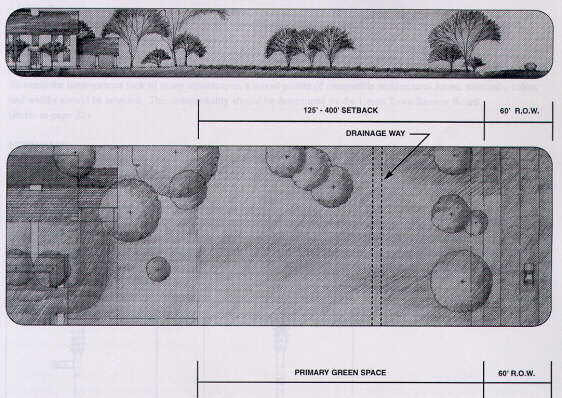 The corridor should be a minimum of 25 feet wide on each side of the stream or as depicted on the Land Use Plan. 8. Areas determined as wetlands or floodplains, should be preserved in compliance with all regulations. 11. Leisure paths and trails should be constructed along creeks and roads in accordance with the Plan. 1. Cluster residential houses should front onto public streets and common open spaces. 2. The maximum lot width should vary in keeping with the existing topography, minimize road length and create green space. 3. The minimum lot size should be 4,000 square feet net. 4. When abutting dissimilar uses, a minimum shared 25-foot buffer zone should be maintained. 2. Building massing should be appropriate to traditional pre-1940 American Architectural forms, scale and massing of the surrounding buildings and setbacks. 3. Modern architectural styles will be reviewed by the UTRB on a case by case basis. 5. All attached dwelling units must be of townhouse style. No flat style units or stacked units should be permitted. 7. Simple gabled roof forms and dormers are encouraged. Flat roofs are allowed only with highly detailed or decorative cornices. 8. Rear lot garages with access from a service lane are encouraged. Should a garage face the street, the garage must be set back a minimum of 10 feet from the front facade of the house. 9. The maximum width of a garage door, which faces the street, is 10 feet. 10. Building materials should be traditional and natural, such as brick, stone, wood, or glass. 11. Any side of a building, which faces a public street right-of-way or green space, should be of the same materials and styles as the other sides of the building. 2. All entry signage should be ground mounted or set into an entry structure and natural in appearance. 3. Lighting if appropriate, should be with direct illumination from a shielded light source. 1. It is recommended that all utilities be located underground. 3. Garbage collection should occur along the rear property line in the alley. The Town Center district includes a mixture of land uses. The land uses are characterized by a diversity of office, business, commercial and attached and detached residential uses in close proximity to each other. Over time, new buildings are recommended to be built as infill development within the existing Town Center area. A wide variety of land uses are permitted in the Town Center including retail, commercial, restaurants, administrative, businesses, professional offices, personal services, consumer services, attached and single family residences. Buildings can be mixed-use in nature with residential or office located above a ground level office or commercial use. Additionally, mixed land uses can occur next to one another. Density: On a per acre basis, no more than 80% of the site can be covered with impervious surfaces such as buildings and parking. The remaining 20% should be planted or green space. Residential uses may not exceed 50% of the mixed-use area. Gross base density should be a minimum of 3 to a maximum of 8 dwelling units per acre. The minimum lot size is 4,000 square feet. The types of residential envisioned for the Town Center includes: attached and detached single family houses, attached townhouses, zero lot line houses and second floor residential units above a commercial or office land use. 2. Mt. Zion Road may be two-way with on street parking on the retail side of the street. 4. Alleys may be used for driving to access parking spaces. 5. 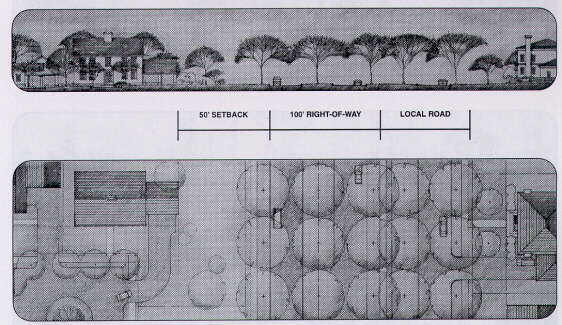 The streetscape should include deciduous street trees planted 40 feet on center. 6. All lighting power and communication utility lines should be underground. 7. Decorative streetscape features such as street lighting, waste receptacles, furniture and landscaping should be coordinated. 8. Sidewalks, other than in retail areas, should be 5 feet wide and located in the right-of-way at a minimum of 5 to 10 feet from the curb. 9. In retail areas, the sidewalk should extend generally from walk area to the set back line for buildings to create a wide comfortable pedestrian zone. 10. The rural setback does not apply in this zone. 1. Parking areas should be located behind or along the sides of buildings. Diagonal on-street parking may occur in front of buildings for retail uses only as shown on Figure 24. 2. Parking should be consolidated between individual commercial, retail and residential uses in lots behind buildings. 4. No drive-through uses are permitted other than for banking related activities. 5. Interior drives between parking lots for adjacent uses should be interconnected where possible. 6. Secure bicycle parking and storage should be conveniently provided as part of the parking plan to the rear or side of buildings. This could be shared by multiple businesses/buildings. 7. At least 75% of the parking should be at the rear of the building. 8. Parking areas located behind buildings should contain curbed landscaped spaces with deciduous trees. These landscaped areas should amount to at least 5% of the vehicular use area and be located throughout the parking area to minimize the parking lotís adverse visual impact. 9. Where parking lots occur in front of a building, they should be screened from primary streets, residential areas, and open space by 3.5-foot minimum evergreen hedge, fence or masonry wall. 10. No parking or drive aisles should be permitted in any setback area other than in the case of drive aisles necessary to grant ingress and egress. 11. All parking lots should be screened from view from adjacent public R.O.W.ís and residential uses. 1. Common open spaces and/or public green spaces that are framed by buildings are encouraged as illustrated on Figure 25. 2. This open space should be fronted on at least 2 sides by public streets. 3. Civic/public space in the Town Center should incorporate natural features and open spaces. 4. 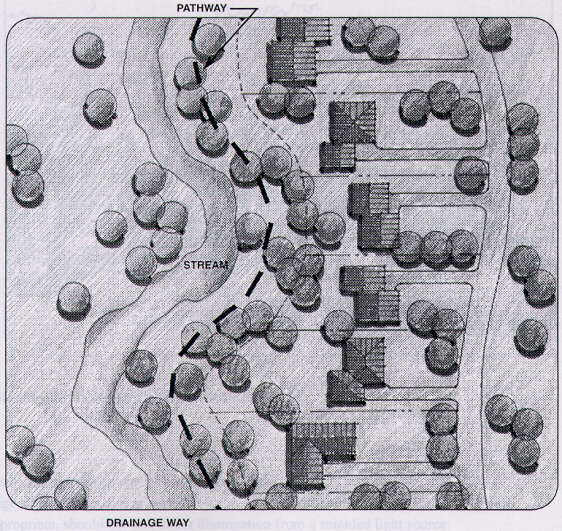 Drainage way corridors should be part of the primary open space preserved in their natural state at a minimum of 25 feet wide on each side of the stream or as depicted on the Land Use Plan. 5. All street furniture, lighting, signage, and landscaping should support the theme of the area and be consistent. 6. Outdoor gathering spaces are encouraged. 1. For retail uses along the existing and proposed Mt. Zion Roads, existing and proposed U.S. 42, a setback line should be established from the street right-of-way, which provides for a 20-foot setback with a sidewalk and street trees as illustrated on Figure 26. At least 80% of the building elevation must be constructed to the setback line. 2. Outdoor dining areas are encouraged along sidewalks or between buildings. 3. For office and residential uses, a setback line should be established 30 feet from the street right-of-way. 4. Attached and/or multi-tenant buildings are encouraged. 5. Excessive gaps and non-useable spaces between building areas are discouraged. 6. When open spaces between buildings occur, pedestrian connections should be established between the rear parking areas and the sidewalk in front of the building. 7. 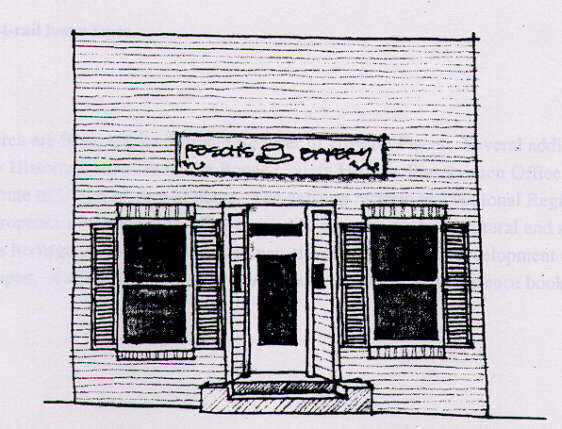 Buildings and individual establishments (i.e. shops, stores, and offices) should have convenient front and rear customer entrances to parking areas. 8. When abutting dissimilar uses, a minimum shared 40+- foot buffer should be maintained. 1. The massing and architectural detailing of buildings should be broken up to maintain a pedestrian village scale. 2. Building massing and scale should be simple and appropriate to traditional American forms as related to surrounding setbacks, surrounding buildings, the spaces which are created by the buildings. 3. Primary buildings should always front on a street. 4. All buildings should have their main entrance on the primary street with a prominently defined rear entry accessible from the parking area. 5. Building design should be more prominent at corner locations. 6. Storefronts should relate directly and clearly to the street. Extensive use of glass is encouraged for storefronts. 7. For non-residential buildings, the maximum use of see-through glass is encouraged on the street level. Reflective, opaque and non-translucent building materials are discouraged at street level. 8. Operable recessed windows on buildings are encouraged. This should apply to floors over street level. 10. Building design should be based on traditional pre-1940 American styles of architecture. 11. Modern architecture design will be reviewed by the UTRB on a case by case basis. 12. Building materials should be traditional and natural such as brick, stone, wood and glass. Other material may be used only if approved by the Union Town Review Board. 13. All building heights should be a minimum of 1.5 stories and not exceed 3 stories as illustrated below. 14. Porches or overhangs are encouraged to the setback line. 15. Sloped or pitched roofs are encouraged. Flat roofs are allowed only with highly detailed or decorative cornices. 16. All rooftop or ground mounted HVAC equipment must be screened from public view with similar building materials or hedging. 17. The rear elevation of buildings facing the parking areas should be designed similar and/or complimentary to the front facade with high quality building materials, lighting and signage. 18. Any side of a building which faces a public street, pedestrian walkway, right-of way or green space, should be compatible materials and style as the other sides of the building. 19. Loading and refuse collection should be consolidated, shared and attractively and completely screened with solidly constructed walls treated the same as the building. 20. Building massing and scale should be simple and appropriate to traditional American forms as related to surrounding setbacks, surrounding buildings, the spaces which are created by the buildings. 1. Signs should be integrated into a landscape feature, streetscape or incorporated into the building design. 2. Each commercial ground floor occupant may display one wall sign of up to 8 square feet. Upper level commercial occupants may do the same. 3. Signs on adjacent street fronts of the same building should be coordinated in height and proportion and are encouraged to use the same format. 4. Proportionate to the building, each building may have one freestanding sign of up to 10 square feet. 5. Colors should be chosen to compliment the facade color of the building. 6. The maximum height of a freestanding sign is 6 feet and it should be located a minimum of 5 feet behind the right-of-way. 1. It is recommended all utilities be placed underground. 2. All telephone, cable, electric lines, transformers and service structures should be located along the alley right-of-way and screened from view. 3. Garbage collection should occur along the rear property line or alley. 4. Garbage collection should be consolidated for multiple properties/businesses along the rear property line or alley. 5. Dumpsters should be screened by landscape or a masonry wall built in a complementary architectural style to the Town Center architecture. Neighborhood retail and office land uses should occur in designated areas in a campus-style setting where greens and landscaping play a prominent role in open space delineation. Office uses and mixed office and retail uses are permitted. Office buildings should be sited in a campus-like manner fronting major roadways with parking located behind the buildings. Building arrangement should provide convenient and safe pedestrian connections between buildings and parking lots, and other civic or public uses. 1. Streets should be two-way. 2. Narrower streets are encouraged to promote a pedestrian friendly atmosphere. 4. Streets should be arranged in a simple, connecting pattern with respect to the topography and natural drainage ways. 5. On-street parking is discouraged. 6. Deciduous canopy trees should be planted no less than 24 feet and no more than 36 feet on center. 7. Street trees should be a minimum 2.5-inched caliper diameter at breast height at installation. 8. 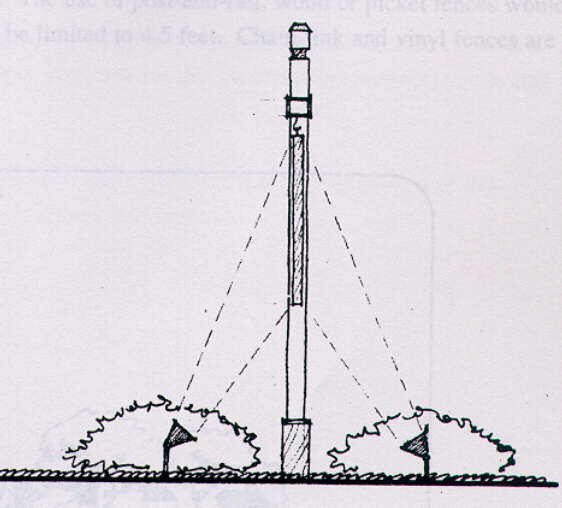 Tree lawn and street tree planting zones of at least 6 feet in width should be provided. 9. Sidewalks should be provided within the right-of-way to encourage walking and should be setback a minimum of 10 feet from the curb. 1. Primary parking as illustrated below, should be encouraged to be located behind office buildings and not between the primary street and office buildings. Minimal short-term visitor and "drop-off" parking can be provided at the front of the building. 2. Parking lots between buildings should be interconnected to encourage parking areas shared among buildings to reduce paved area. 3. Parking areas should be screened from view by evergreen landscape materials or masonry walls to a height of no less than 4 feet. 4. Parking areas located behind buildings should include curbed landscaped spaces with 1 deciduous tree planted for every 10 parking spaces. These landscaped areas should amount to not less than 5% of the vehicular use area and be evenly distributed throughout the parking area to minimize the visual impact of the parking areas. 5. Secure bicycle parking and storage should be conveniently provided as part of the parking plan to the rear side of buildings. This could be shared by multiple businesses/buildings. 6. The minimum amount of parking required is one space per 250 square feet. 7. No parking or drive aisles should be permitted in any setback other than in the case of drive aisles where necessary to grant ingress and egress. 1. Office buildings should be setback from the primary street right-of-way a minimum of 50 feet to maintain a natural greenway as a visual amenity. 2. Common open spaces or green spaces that are framed by buildings and that create a "campus-like" office environment are encouraged. 3. Drainage way corridors should be part of the primary open space preserved in their natural state at a minimum of 25 feet wide on each side of the stream/drainage way or as depicted on the Land Use Plan. 1. 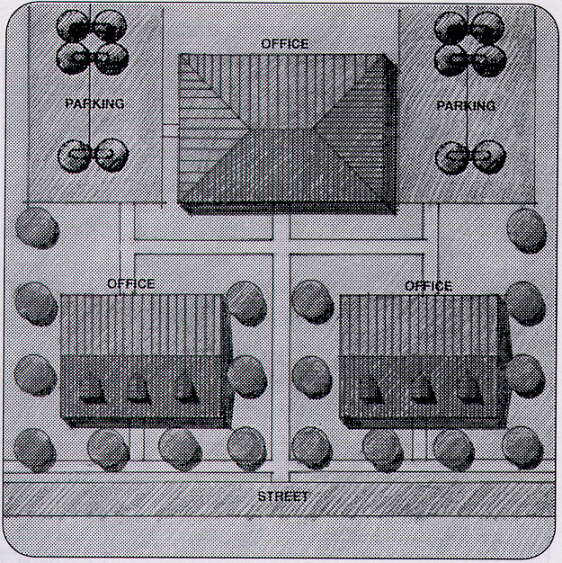 Buildings should be oriented to front the primary public or private roads as shown below. 2. Buildings should not back onto a public right-of-way: the rear elevation of the building is encouraged to have the same architectural treatment facing public open space and greenbelts. 3. Lot size should be varied to create green spaces. 4. 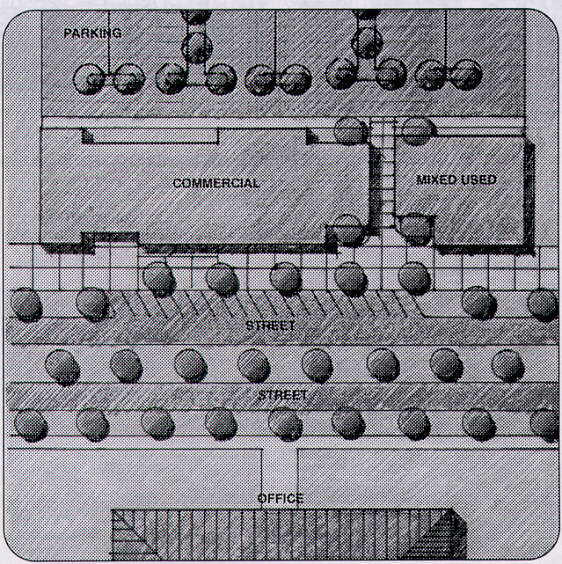 When open space between buildings occurs, pedestrian connections as shown below, should be established between the rear parking area and the sidewalk in the front of the building. 5. When abutting dissimilar uses, a minimum 40-foot buffer zone should be maintained. 1. Office buildings should be sited in a campus-like manner that will produce a clear sense of place, identity and encourage interaction and ìcommunityî among users. Buildings should be sited in relationship to each other and open green spaces and squares to provide pedestrian connections between each building, to parking, and to any other civic or public uses within convenient distances. 2. Any side of the building which faces a public street, right-of-way, or green space, should be of compatible materials and style as the other sides of the building. 3. The maximum building height is 3 stories. 4. Front and rear building setbacks should increase 50 feet per 15 feet increase in building height after 45 feet. 2. Each ground floor occupant may display 2 signs; upper level occupants may display one. 4. Colors should be chosen to compliment the facade color of the building. 5. Proportionate to the building, each building may have one freestanding sign of up to 10 square feet and one wall sign of up to 8 square feet.